Thanks to Black Twitter, the world now knows the significance of potato salad to Black Americans. I don't know why this is, or why potato salad, of all foods, but I do know that "Who made the potato salad?" is the first question you ask before making a plate at a cookout. Because you don't eat just anyone's potato salad. But decades before Twitter existed, my mother instilled in me this culinary suspicion and potato salad monotheism: hers was the one true way to make it. She would bring her potato salad to cookouts, baby showers, and other events, even when she wasn’t asked to bring it. People raved about my mother's potato salad and this only reinforced her belief that hers was the only acceptable potato salad and no one else’s would ever measure up. Dice the potatoes. Cook until firm. Unless you plan to make mashed potato salad. Also put on a pot of eggs to boil. Drain the potatoes and let cool on the counter, and then chill the potatoes and eggs inside the refrigerator. Finely chop some bell pepper and white onions. Don’t be lazy and chop them into hunks. No one wants hunks of bell pepper and onions in their potato salad. If you can’t do it right, then move and I’ll do it. Once the potatoes are cold, chop the boiled eggs. Combine the potatoes and egg in a large bowl with the peppers and onions. Then do all of the following BEFORE stirring—you don’t want to overstir and end up with mashed potato salad: season with Lawry’s, black pepper, and paprika; add mayo, not Miracle Whip; add yellow mustard (this is not white people potato salad); add pickle relish. Stir just enough to blend and coat the potatoes. You should have added enough mustard and paprika so that it is almost day-glo orange and not white like white people potato salad. Sprinkle a little more paprika on top. And serve. You know, I don’t eat anybody’s potato salad except Van’s. She’s the one who taught me how to make it. - Deesha Philyaw is the co-author of Co-Parenting 101: Helping Your Kids Thrive in Two Households After Divorce, written in collaboration with her ex-husband. Deesha's writing on race, parenting, gender, and culture has appeared in The New York Times, The Washington Post, The Pittsburgh Post-Gazette, FullGrownPeople.com, and elsewhere. At The Rumpus, Deesha inaugurated an interview column called VISIBLE: Women Writers of Color. Use a skillet big enough for only one egg. Others may want one; they can make their own. Your daughter asks you to show her how; you tell her you'll teach her, but later. When you're finished eating. She'll forget because children are stupid, forgetful. She'd ruin it anyway, and waste an egg. Adjust the tie on your bathrobe. Pour a scotch. Slide the egg from the pan onto one of the good china saucers—you didn't carry them across the ocean to sit in a cabinet. Bring it and your drink to the table along with the Times you've tucked into your armpit. Cut the egg all at once in neat rectangles; salt and pepper it well. She will watch you, ask how you knew when it was done. Ignore her. Set your knife, dripping with yolk, delicately, nearly noiselessly across the plate's edge. Others would drag the blade across the fork to retrieve the leavings, but that is a chore for people who have not-enough. Take a bite. Open the newspaper and hold it in front of you. She will ask for a taste. Ignore her. She will ask for a bit of the paper. Remove the funnies; place them beside your plate. Hand her the business section. She will give up soon enough. She made Fleischkuechle, a strange sounding name for hamburger rolled in flour and fried in a pan. Afternoons, school finished, I’d watch her at the stove, her hair sometimes stacked up in curlers like a fern, sweat trickling down her cheeks from the heat in the kitchen, the spiced tang of meat ripe in the air around us as I sat at a table struggling with math homework, struggling with puberty, struggling with being her son. She was a focused chef. All the good ones were, she said. We were poor but still she was a chef. I wished she'd pay me as much attention as the food she prepared. My brothers were always away and I wasn’t sure how to talk to my mother so I’d make up terrific lies that she may or may not have believed. It gave us something to talk about. “Here,” she’d sometimes say, tossing me a potato peeler. “Strip these as fast as you can.” Strip for peel. A dozen potatoes on the counter, things that looked more like gourds or discarded embryos. 1916 color lithograph by Yvonne Vernet from the Library of Congress Prints & Photographs Online Catalog. As I peeled potatoes I felt Mother coming up behind me, which made me speed up the slicing of the skins. I wanted her to think me capable of carrying out a command. Cigarette smoke wafted over my head and into my eyes, stinging, and I hoped they wouldn’t water. “Yes you are,” she said, dropping the potato on the table. I heard it thunk, watched it roll off and bounce across the floor. “Pick it up and wash it,” she said. We raised and butchered chickens. It’s a scary thing when you’re nine. The beheaded birds would fly off squirting blood, dead but somehow still alive, like me, I’d think. Mom would place a box of Salerno saltine crackers, a large jar of smooth Peter Pan Peanut Butter along with a couple of sticks of Blue Bonnet margarine on the kitchen table, putting my older brothers and sister in charge of breakfast. The center of the table had a stack of comics for our morning reading. Coffee was bubbling in the percolator on the table’s edge. My oldest brother Rich would open the box of crackers to begin the process. He would cut a wedge off the margarine and spread it across the crackers, salty side in. My other brother Pat would slide a knife full of peanut butter on a separate cracker and press the buttered side together with the peanut butter one. My older sister Ruth would pour us each black coffee while I watched the assembled crackers rise on a plate like a Jenga tower before my two brothers decided we had enough. We would each grab a stack and dip them in our coffee, watching the oil seep across the surface. I loved to squeeze my crackers to make margarine ‘worms’ curl out through the holes. Speaking was at a minimum while we dunked crackers in coffee, ate, traded comics and refilled coffee cups. It was the start of our day. - Kathy Doherty has a Bachelor’s in Creative Writing from Metropolitan State University Denver. She has published work in airplanereading.org, Metrosphere, Foliate Oak, Hot Metal Press and One Million Stories Anthology. She lives in Parker, Colorado with her amazing Siberian Forest cat, Vladimir. My mother wanted all for whom she baked to enjoy their fair share. She often adjusted her work to make sure. Take her chocolate chip cookies. Surveying twenty-four blobs of raw dough on the last two cookie sheets, she redistributed chocolate chips and walnut pieces until she achieved fairness. Only then did the dough go into the oven. When she baked a pan of bread pudding or a casserole of rice custard, she inspected the stirred, poured mixture for an equal distribution of raisins before entrusting the dish to the oven. When Mom was visiting after the birth of my second child, she offered to make me a healthy bread pudding full of whole wheat bread, eggs, milk, grated apple, cinnamon, and, of course, raisins. While I nursed the baby in the kitchen, mom and I chatted quietly as she measured, mixed, and stirred. The longer my son nursed, the hungrier I became. At last, he fell asleep, and I was ravenous. But mom hadn’t even put the pan of bread pudding into the oven. Unconsciously, she had been placing one raisin at a time into the mixture as though planting equality in perfect rows. - Andrea (Andi) M. Penner, President of the New Mexico State Poetry Society since 2015, arrived in New Mexico for doctoral work in 1994, and stayed to teach college English. She now works as a technical writer, editor, and program communications specialist, and writes creatively in the wee hours. Her first collection of poetry, When East Was North, was published in 2012 by Mercury Heartlink. Bread pudding is forgiving, not exact. Be sure to use dry bread so you don't create a mushy mess. If your bread is fresh, you can dry it first in a 300°F oven, or toast it slightly in a toaster. Preheat oven to 325°F and lightly grease a small baking dish (8" x 8"). Beat together eggs, milk, sugar, cinnamon, and vanilla in a mixing bowl. Mix in the grated apple. Place the dry bread pieces in the baking dish and sprinkle it evenly with raisins. Pour the egg mixture over all. Bake for 35-40 min, or longer if needed, until a knife inserted in the center comes out clean. Crack six eggs in that blender. Add 1 ½ cups of water and flour, but not all at once or you’ll clog the blender. Let it run for a few seconds. Don’t overmix it! The batter has to rest for half an hour, so let’s get the ricotta going. I hope you didn’t buy fat-free, it’s tasteless. Get rid of some of the liquid. Dump the ricotta into that big bowl. Now crack a couple of eggs and fold them into the ricotta. Marie La France in 1990 wearing her much loved Kmart blue smock. She is actually holding a Kmart flashing blue-light special lamp. The picture was taken during the author's sister's surprise 30th birthday party. She is laughing so hard she's doubled over. We have to chop the parsley. Is it washed? It has to be dry or it won’t chop. I told you to wash it last night. You never listen. Did you get flat-leaf? Curly parsley is terrible. Let’s do the crepes now. Heat up the crepe pan—medium low. No oil. The first crepe comes out lousy. Don’t worry about it. Grab that gravy ladle and pour a ladleful into the pan. Swirl the pan so the bottom is coated. Wait for the edges to curl and come away from the pan. Okay, now grab that spatula and pick the crepe up—GENTLY! Put it on the dish towel. Now listen, wait for the pan to heat up again. You’re always so impatient. - Denise Sawyer is a new writer enrolled in the Creative Writing and English program at Southern New Hampshire University. She is also an active member of the Creative Women Writers of Greater Derry located in Derry, NH where she shares her creative works with other new writers and published authors. Her latest endeavor is a memoir taken from the pages of her diary penned at the age of 16. The year was 1971 and she has some doozies. She lives in Londonderry, NH with her musician husband, Jeff and their cat, Dizzy named after the great jazz musician, Dizzy Gillespie. Denise makes manicotti every Christmas Eve, and tries to remember to wash the parsley the night before. The first time you cook for her after moving in, make sure it’s something fancy. A rubbed pork-loin perhaps. Spend a week researching it online, and all day cooking it. When she comes home, the delicious smells will permeate the hallway. Serve it with ginger mashed potatoes and Harissa-infused butter. “What’s Harissa?” she’ll ask. You will explain. It will be delicious. After you get engaged, take things a step further. Prepare an Indian-spiced turkey with a green rub that sits in the fridge for days. It will look disgusting but result in the most juicy, flavorful, subtly-spiced turkey any of your friends have ever tasted. Serve it at the annual Thanksgiving potluck. It will be the first to go. Collect spices. Common and obscure ones. Things she’s never heard of. Things she has no idea how to use. 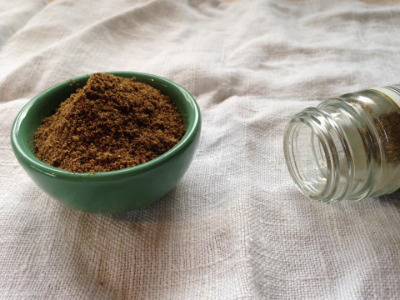 Garam masala. Fenugreek. 6 varieties of pepper. So many spices that you quickly run out of room in the limited cabinet space provided in a small, New York City apartment. Build a custom spice cabinet from scratch to accommodate them all. A narrow base cabinet, 6 inches wide and 24 inches deep. Buy a new wooden butcher-block countertop to cover it, and while you’re at it, replace the old, peeling Formica countertop throughout the entire kitchen. Go to sleep and never wake up. A month before your wedding, she will be out of town and one of your closest friends will find you there, in bed, covers wrapped around your still body. The spice rack, and spices, and the hard drive full of untried recipes will remain. Maybe one day she’ll find the strength to use them. Two weeks before Christmas, your nephew’s wife calls for a recipe. “Christmas isn’t Christmas without your trifle, Aunty Pauline!” she says. You agree. It’s your mother’s recipe. You make it faithfully each year, remembering her hands moving swiftly, the smell of her kitchen. You recall marvelling at how the cake, custard and gelatine kept obediently to their separate layers. Use day old sponge cake, cut into squares. Spread jam over each one. Any flavour, but I like strawberry. 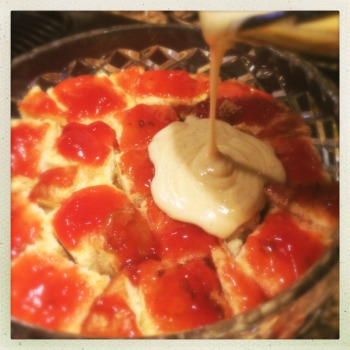 Dip each jammy square quickly into sherry. Don’t let it fall in, or rest too long. It’ll soak up too much sherry, and everyone’ll get drunk on dessert. You can substitute 100% orange juice — for the kids and the wowsers. Make up some custard with egg, milk, sugar. Thicken it with custard powder. Line the base of your glass dish with the sponge squares, jam side up. Pour the custard over the top. Put this in the fridge to cool. That’s very important. You have to make sure it’s cool before you add the jelly or the gelatine’ll melt. Use Port Wine jelly (or orange, for the kids’ version). Don’t buy the cheap stuff, you’ll taste the difference. Make it up, and let it set in a separate bowl. 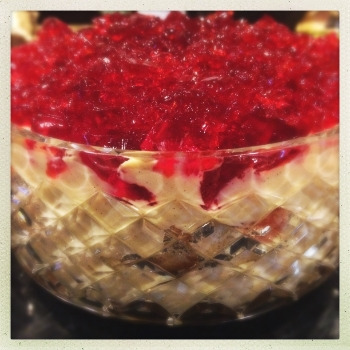 When everything’s good and cold, when the jelly’s set, crumble it and fork it on top of the custard. Don’t mix it through. Separate layers are more festive. You put down the phone, and pick up your grandmother’s bible. That too, you’ll pass on to your nephew’s wife. I am sitting in the kitchen of my grandparent’s house, after school. It is 1969. Corny old fashioned things—like home remedies and mountain music—are all the rage. My grandmother tells my hippy cousin in Pennsylvania on the phone how to make her own stomach ache medicine. She says it all without stopping washing the dishes as she talks. The phone is cradled on her neck, the long green cord hanging down from the wall to where she is standing. Take your cast iron frying pan, she says, you have a cast iron one, right? I know your mother had one. Good. Get it hot, then throw in a handful of pearl barley. Yeah, just a handful. It’s got to be pearl I don’t know why. Add a little water. Just a little. Stir it. It smokes and it stinks. Keep on adding water as the barley cooks, until the barley fries black, then you add a little more water, you know, maybe a shot glass full, stir it and pour it back into the shot glass through a clean white handkerchief. Or whatever you got over there you can use. Let it cool. Drink it. It tastes like poison, but it works good. My grandmother stops talking, turns the tap to put more hot water in the sink, then: Do you see your brother a lot? Tell him hello for me. So when are you coming down? Juleigh Howard-Hobson lives on a permaculture farm in the Pacific Northwest, where the home remedies she picked up from her grandmother in Greenpoint Brooklyn are still the rage. (Although, that burnt barley recipe will never be a favorite.) Her work has appeared in The First Line, Prime Number, KeyHole, The Liar’s League, Going Down Swinging, Danse Macabre, Pemmican, Sugar Mule and plenty of other places in print and in pixel. Not bad for a person who spends entire mornings moving straw bales around. My father made the early morning tea, a vigorous, wake-up decoction. Everyday. Fill a saucepan with water from the UV-purification apparatus. Don’t leave it on the stove too long; it makes the oxygen boil away and the tea taste flat. Is that a scientific explanation? All I know is freshly boiled, not over-boiled. Assemble the cups, sugar, milk. The ceramic teapot. A splash of hot water to rinse and warm the pot. Don’t try scrubbing the stains off. It give the tea a detergent flavor. Lipton Red Label. Yellow Label will do too. No pale, high grown varieties. A teaspoon-full per person. Pour in the boiling water. Put the lid on. Wrap the teapot. A tea cosy? Too dainty, too tight, pulls the lid off. Use a kitchen towel. Wait for seven minutes. Yes, seven. Gives you time to warm the milk, step out on the verandah, think. Longer is fine, if you like it strong. Now I make the tea. It is weak and dissatisfactory, not steeped long enough. I don’t want time to think. We drink it by my father’s bed. The bed is low, fitted with wheels and stand-up sides, and has a mattress covered in layers of plastic protection. Mostly he is still, but every now and then, he flings himself about and the bed slides. The teak case that houses mementos of my parents’ life shakes with the impact. Behind the glass doors of the case, the jointed mobile segments of the papier-mâché dancer with arm outstretched jiggle back and forth, the chipped, yellow finger pointing. Were he with me, we would have laughed. - Indira Chandrasekhar, a scientist turned fiction writer founded the magazine Out of Print, an online platform for short fiction connected to the Indian subcontinent. Her short stories have appeared, among other places, in Far Enough East, rkvry, Eclectica and The Little Magazine, and have won awards and been shortlisted, most notably in the Mslexia shortstory competitions. She is the co-editor of the anthology, Pangea, Thames River Press, 2012. Links to her published work may be found on her blog, indi-cs. Cut carefully around your avocado, longways. Twist to separate and spoon out half the insides. Spread onto toast and sprinkle with salt and pepper. Over the next twelve hours, the other half will brown. You can't bring yourself to eat it so you peel away the gummy, dried exterior, pry loose the pit and toss the rest with regret. Clean the pit gently with warm water. Reach into the spice cabinet for the twenty year old box of toothpicks you stole from your grandparents' house and will never empty. (Your sister will, though, and store it, flattened, between photos of you at her first birthday party.) Pierce the pit with three toothpicks spread equidistantly, careful not to snap these tiny supports in half. During rainy months they'll bend on insertion and you will say to no one, "oh, crumb." The author at her first birthday, with brother Asa, age 13. Suspended in a half-full cup of water, the pit sprouts roots and stem if you shuttle it from sunbeam to sunbeam. Eat half an avocado on toast once a week. Leggy, an undeniable eyesore, their roots will circle the bottoms of jam jars and promotional glasses from The Spaghetti Factory. Change the water weekly but never plant a single one. When you don’t have enough, it’s okay to substitute. Any chef will tell you substitutions are crucial to innovation. However, in grandma’s house, innovation often tasted bitter. Grandpa would point us to the refrigerator and nearly beg us to eat whatever was in there. “Get it out of the house,” he’d say. One of grandma’s favorites was Rice Krispy treats, a delight in nearly any other kitchen. Here, they were always rock-hard. Yet the recipe is so simple I can easily recite it from memory. Pictured: The author's brother and grandma, with a safe, store-bought cake. The fact that we have no pictures of her in the kitchen helps prove the point that she was not immortalized there. Now that I’ve learned to cook, I want to take her into my kitchen, to resurrect her from memory and make her real again. We’ll spend an afternoon skipping work, playing in the kitchen. She’ll ask where the rolling pin has gone, and I’ll tell her it’s in a box back in Spokane, along with her china and matching silverware. She’ll pet the cat and ask if I’ll ever move back home. And while we make our batches of gooey, peanutty treats, I’ll tell her that I would if she would be there, too. I would, even for her home-cooked meals. - Jenne Knight’s Peanut Butter Rice Krispy Treats are made with 1c granulated sugar, 1c Karo syrup, 1c creamy peanut butter, and 6c Rice Krispies cereal. On the stove, slowly melt the sugars and peanut butter in a large soup pan. Remove from heat. Stir in the cereal. Once coated, immediately pack the mixture into an 8 by 8 pan. Let cool. Eat. Find more at www.jenneknight.com. cooking, grandparents, Grandmother, improvising, Rice Krispies, Karo syrup, peanut butter, recipe, Raisins? 1. Maybe it’s Hollywood, 1930’s. Pepper trees line the boulevards. Down Vine, my grandmother makes almond cake for what they call entertaining. She can’t get used to her new life. My grandfather lines up cigarettes in ashtrays around his typewriter, two or three burning at a time. Bob Hope calls. The clacking sounds to her like machine guns through the stucco. Sometimes, there is a bang. Start with a three layer yellow cake, whatever you’re used to, or just make it from a box like she did. Sometimes, nothing comes through the wall but silence. 2. Cook ¼ tsp instant coffee, sugar, corn syrup, water, and almonds in a small saucepan until it reaches hard crack stage. 290 degrees. Add soda, for fizz. The spines of her cookbooks line up against the milky tilework. Betty Crocker holds a cake up, hair backlit. In the pale kitchen, Grandma is nineteen—her hair is like a movie starlet’s, waved and shellacked—a gardenia behind one ear. Her waist no larger than two hands, white crinoline flouncing around her knees. When she needs to reduce, the doctor gives her pills. 3. Pour onto an ungreased pan, bare and cold. The mixture will grow brittle as it cools. Layer the cake with whipped cream. Grandma will tell us over and over again about schmaltz and gribenes too, but she will never describe how to make them. Too heavy, she will say, and anyway she hasn’t eaten that way since she was a child. There are no kosher butchers at Ralph’s on Santa Monica. Wrap a hammer in a towel and crush the candy into shards. Press them into the top and sides. She displays the cake, elegant and brown, on a white pedestal. 4. The beautiful part is you can freeze your cake ahead. It will slowly thaw under the icing until tender and light, ready for company. Food is more wholesome this way. No one plucks a chicken like they did among the tenements, blood drained, the meat blessed and waiting. - Nora Brooks is a writer whose poetry, fiction and cultural coverage has appeared in PopMatters, H.O.W. Journal, Alimentum, Monkeybicycle, The Best American Poetry blog, and elsewhere. A recent graduate of The New School, her short prose chapbook How to Boil an Egg and Other Recipes was this year's runner-up in the prose contest of George Mason University's Gazing Grain Press, and a mini-chapbook will be published in 2015. She lives in Portland, Oregon with her husband and too much taxidermy. Image courtesy of The Biodiversity Heritage Library via Flickr. 1. Wash the lunch and dinner dishes. Take a pinch of snuff from the tiny glass jar in the pantry. Ride out to the pasture in the pickup with your husband, listening to Willie Nelson and wishing you had time to go dancing. Put feed out for the cows. Afterwards, sit in your recliner with the Avon and Fingerhut catalogs. Dream until it is time to go to sleep. 2. Get out of bed when the rooster divides night­dark from morning­dark. Put on your britches. Smooth out the quilt and arrange the fancy pillows. 3. Make Folgers in the percolator. Bake a pan of whop biscuits (named for the sound the can makes when you bang it open). Fry some sausage patties, then use the grease for gravy and scrambled eggs. Get up a full plate for your husband. Eat a biscuit or two at the sink while doing the dishes. 4. Feed the good scraps to the dogs and the not­so­good scraps to the hogs. Toss dried corn to the chickens. Hunt for eggs in the pole barn. Watch out for snakes. 5. Water your garden and pick what is ripe. Pull weeds from the flower beds. Run the push mower around the storm cellar and under the low­hanging mimosa limbs. Swear at the dogs when they get underfoot. 6. If your husband comes in for lunch, give him a ham sandwich with Fritos and some of your homemade chow­chow. Reheat a cup of coffee for yourself. 7. Dust figurines, plastic greenery, oil lamps that are never lit. Straighten doilies and floor runners. Scrub your hands with Irish Spring. Consider putting on some lipstick or face powder, but decide against it. Your hair will be flat until Friday and you are missing a breast. 8. Gossip with your daughters, sisters, or whoever picks up on the party­lines. Everybody needs something to do in the hot part of the day. 9. Start dinner: fried steak and mashed potatoes. Your husband no longer has to be dragged out of a bar or another woman’s bed in the evenings; he will come home on his own. Pour a big glass of buttermilk for him to chunk up his cornbread in. 10. Brew fresh coffee for yourself. Set out a plate (but not silverware). Add lettuce and quartered tomatoes from your garden. Drizzle Wesson oil over top, and shake a little salt. Take a bite from your plate, then from the raw onion in your other hand. Your eyes never water. Who says you can’t eat a good onion just like an apple? - Amy Nixon is an award-winning poet and songwriter whose work is included in the anthologies Begin Again and To the Stars Through Difficulties: A Kansas Renga in 150 Voices. She lives in the Kansas City area and spends as much time as possible antiquing and eating guacamole with her best friend, Olive. Once upon a visit to my childhood home, my grandmother winced to watch me toss into our kitchen garbage bin an emptied Styrofoam egg carton (remember these? the shapely squeaky cups seemed to ask, no matter how matter-of-fact you fondled them). I winced as I watched her reach under our kitchen sink, into the stinking trash to retrieve the carton—to bring it back into the light of use, but differently. For she then set it on the floor, and stepped to it—stepping on it—each squelching shell popping beneath her small feet dancing, until the carton was a cartoon of itself, flattened. Now it could be trashed better, and she laughed to see me stunned by the world more neatly wasted. Years pass and compression complicates the matter. Landfills rise to the surface of someone’s memory, sometimes beautifully. My wife, born and raised in Tokyo, never met my grandmother of the farmlands of Cambridge, Ohio. She danced this way over-and-all-through the thing, laughing. "Universal waste like batteries and lighting equipment should not be mixed in with regular trash,” Terence Huber learned lately, and removed lighting equipment from his usual curbside pick-up in Lakewood, Ohio. Out of the darkness, other works of his will appear or have been published in American Letters & Commentary, Denver Quarterly and Great Lakes Review. When a grandchild pesters you for a sip of your coffee, because you have a known sweet tooth and she figures whatever you're having must be good, make a strong pot and give her a steaming mug of her own. Telling her coffee will stunt her growth won’t work. She is contrary and will say she prefers to be small. She still isn’t brushing her teeth because someone tried to turn Merritt Morrison’s dentures into a cautionary tale. That backfired and now she wants false teeth just like he has. Give it to her straight, so full she can hardly lift it. After her first burning taste she will leave you alone. Don’t say you haven't had your coffee black since the war. Add milk and sugar when she wanders off to pet the poodle. Stir idly, enjoy. In the afternoon the child will grab her customary can of Coke from the fruit cellar. She’ll find you first, sweeping sweet-smelling sawdust in your little basement woodshop or enjoying the sun on a patio lawn chair, planning tomorrow’s puttering. Maybe you will trim the apple tree, or hose off the cement Virgin who presides by the shed. Do you want a pop, too? She’ll drink hers in front of the TV with M&Ms from the cut glass candy jar by your seat on the couch. This same method works for your evening 7&7s. Let her have a harsh taste of Seagram’s before you sweeten it. She won’t bother you for another sip and her mother will come take her home as you turn the dial to Wheel of Fortune. - Meredith Counts is a Founding Editor of Dead Housekeeping. This piece appears on the three month anniversary of starting this site. Mama’s verbal instructions were simple. But there were so many variations. 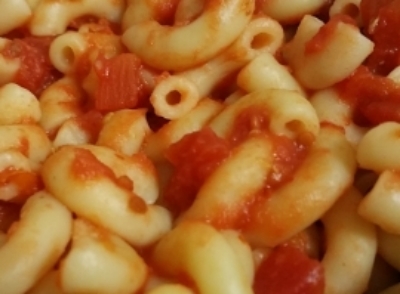 Method 1: Combine cooked macaroni noodles with a jar of home-canned tomatoes. Talk to your little girl about when we all drove up to Aunt Char’s farm, and picked and canned them. Sit down at the table to eat with her. Tell her a story, or sing her a song when you’re done. Method 2: Combine noodles and home-canned tomatoes as above. Call for your daughter to come to the kitchen and eat. She stays so busy now. Be gracious and understanding when she rushes off after eating to go spend time with her friends. Method 3: Heat up a bowl of the macaroni and tomato you made the previous night in anticipation of your daughter coming home for the weekend. Listen while she tells you everything about college. Smile and keep it to yourself that you know she isn’t telling you everything. Method 4: Use a store bought can of tomatoes because it has been many years since you could pick and can your own. Hold your new granddaughter in your arms while her mother eats a bowl of the best food in the world. Method 5: Hold your daughter’s hand while she reminisces with you about how she always loved your macaroni and tomato. Laugh about what a simple thing that was. Smile and squeeze her hand a little tighter when she sheds a tear and tells you it is her favorite food in the world. - Nena Gravil is a writer and an artist who works a daytime gig as an Information Systems Security Engineer to pay the bills. She shares a home in Nashville with two snakes, two cats, and one dog. Nena has one daughter, one girlfriend, and one best friend, and she understands exactly how fortunate she is. Sometimes she sings way too loudly in the shower and it's ridiculous. She taught me how to dry roast spices. She told me grounding spices was like any other art that we learnt at institutions. Pour all the spices into a container. I would stir them for as long as she told me to, while listening to her stories of distant lands. Put them into a bowl and let them cool. When they have, incorporate them into dishes and serve them with a lot of love and care. Powdered spices were never to be served as anything but garnishes. A pinch of turmeric was to be added to all rice dishes. Only whole spices could be bought. She taught me so many things, which I carry with me even today. But the most important of them all was that cooking is meant to be taken as a form of art and expression of love that has the ability to touch not just taste buds, but also hearts. Always remember, a dish served without love, is a dish not served at all. - Trivarna Hariharan is an author, musician, filmmaker and humanitarian. Her work has been published across the globe, in various literary magazines, zines and journals such as Teen Ink, YoungMinds, Literature Studio, Writers Asylum, Textploit and so on and forth. Her first poetry book, " Musings of an Alchemist" has been published by CreateSpace. She holds a grade 4 distinction in keyboard from the Trinity College of London. Her film won the Chinh India Best Film-2014. She is currently working as a school representatives member at a social organisation called Redefy and is the Social Outreach Coordinator at Textploit.